Update 9/16/2018 – Dan has decided to lower his asking price to $2,000! Make sure to contact him via the form below. 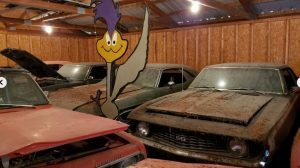 A true barn (ok, shed) find, this 1956 Ford wagon has had only one owner and therefore comes directly from the original owner! Reader Dan M. has decided to sell this car and has given us quite a few details and pictures for you to look over. If you are interested, please contact Dan through the form at the bottom of this listing! What Makes It Special? 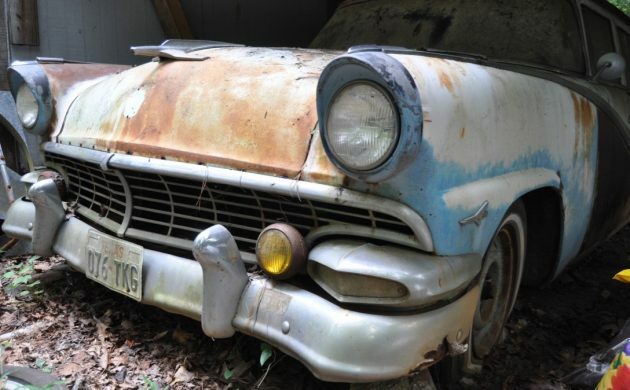 It’s a one owner 1956 Ford Fairlane Country Sedan that has never been wrecked. Body Condition: The body is straight although extensive surface rust is present. 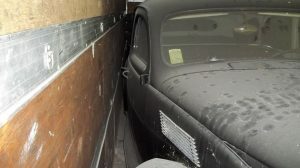 Fenders, wheel wells, a door, and tailgate have rust holes. The interior headliner is torn, door panels are warped, seat covers are decent but non-original. The padded dash is beyond repair and must be recovered. The floor panels have pin holes except for the right rear that has more extensive rust. The spare tire well is solid. The third seat frame is missing. Please note that the car has a 1955 hood with a spare from another ’55. There is also a replacement tailgate included although it has some rust but not as extensive as the one on the car now. Mechanical Condition: The drive train is a Ford 292 Y block, 4 barrel carb with the Fordomatic transmission. The car ran when it was parked, it pulled itself from the road to its current parking spot. It was last licensed in 1989. It has not been cranked for 20 years. When it ran, the engine ran well but carburetor was in need of tuning. The engine would choke out until hot. Transmission would not engage unless the car was put into drive and transmission got hot as well. The front cross member is rusted but another from a donor is included. Thanks to Dan for listing this cool wagon with us! 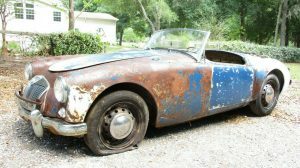 If you would like to sell your classic vehicle, you can list it with us here on Barn Finds! The rotten front crossmember is a common problem on the 55 and 56 fords. You have to first find a clean non rotten crossmember, then pull the nose and front suspension so you can weld in the new crossmember, This one seems like a dirty bird especially for 5 large. You would really have to want it. Dang! That’s a lot of rust for a car with Texas plates! I’ve spent most of my life in the Northeast, so I’m familiar with rust and how to properly deal with it. But I wouldn’t take this one on, despite my love for wagons and ’55-’56 Fords. I hope somebody is willing to give it a go. At the end of the day, what would it have cost you? I hope you have a snorkel available as I think you would be well under water at closing time. Soft spot for the 56 Ford. The “never wrecked” comment strikes me as suspect, considering the front left fender has either been repaired or replaced decades ago. That, and “ran when parked” means little even if it was parked last year. It either runs, turns over, can be hand-turned, or is seized. But regardless, “now” is what’s relevant. The engine is toast. For that matter, so is the rest of the car. The only way this will bring $5,000 is if that’s the scrap value. Absolutely no disrespect intended, but on what planet is this worth 5 large? 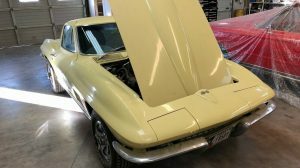 It needs extensive restoration of virtually every single part on the car. Unless ’56 Fords are the new Porsche 911, this is unlikely to get restored. Realistically, it’s probably a parts car, unfortunately. And I LIKE 55-56 Fords. But you can buy a driver ’56 Wagon for far, far less than it would cost to attempt a resurrection of this one. Maybe I’m missing something, but I just don’t see it. Ichy! I basically like the ’56 Ford, wagon or otherwise. But, this one…………? ?